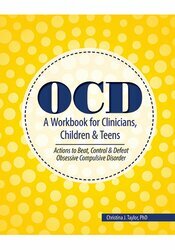 OCD: A Workbook for Clinicians, Children & Teens is a user-friendly, creative and interactive book to help children and teens take control of OCD. With specific chapters for each type of OCD, children and teens will learn cognitive behavioral strategies to overcome their obsessions and compulsions. Strategies for contamination, checking, worrisome thoughts, perfectionism, hoarding, and religious obsessions and compulsions. Christina J. Taylor, Ph.D., specializes in Cognitive Behavioral Therapy for Anxiety Disorders, including Obsessive Compulsive Disorder, Panic Disorder, Agoraphobia, Social Phobia, Generalized Anxiety Disorder, and specific phobias. Dr. Taylor lectures widely on anxiety disorders and provides training workshops for mental health professionals. She is an Associate Professor of Psychology at Sacred Heart University in Fairfield, Connecticut.